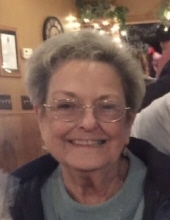 Cheri Eversole, longtime Cushing business woman, passed away Monday, December 3, 2018 at her home at the age of 74 years. The daughter of the late Tommy and Jessie Robbins, Cheri was born on September 7, 1944 in Cushing, Oklahoma and was raised and educated here, graduating from Cushing High School. She was united in marriage to Bill Acklin and to this union two sons, Mark and Justin were born. She was later married to Audie Eversole and in this marriage she gained a son, Jason. Cheri had worked for Clara Mae Daniels for several years prior to owning and operating Cheri’s Income Tax and Bookkeeping in Cushing, retiring in 2015. She was a member of the First Christian Church; she loved to quilt and spend time with her friends, and family, especially her grandkids and great-grandchildren. Cheri is survived by her husband Audie Eversole of the home; her children, Mark Acklin and his wife Judy, Justin Acklin and his wife Kendall and Jason Eversole and his wife Lindsay; 10 grandchildren; 4 great-grandchildren; several nieces, nephews and other relatives and friends. In addition to her parents, she was preceded in death by one brother and two sisters. Graveside services will be Thursday, December 6, 2018 at 10:00 a.m. in the Fairlawn Cemetery with Pastor Kevin Clouse officiating. In lieu of flowers, memorial contributions may be made to the Oklahoma Medical Research Foundation, COPD Research, 825 Northeast 13th Street, Oklahoma City, Oklahoma 73104, in her memory. To send flowers or a remembrance gift to the family of Cheri Eversole, please visit our Tribute Store. "Email Address" would like to share the life celebration of Cheri Eversole. Click on the "link" to go to share a favorite memory or leave a condolence message for the family.